The father of a Penn State University student who died after a bad fall at an alcohol-fueled fraternity event says his family was "highly offended" by what he described as jovial courthouse behavior from frat members facing charges in the boy's death and an insensitive remark by a lawyer in the case. Jim Piazza, the father of the late Timothy Piazza, alleged that some of the young men accused of not giving proper aid to his dying son "laughed" and "patted each other on the back" after a preliminary court hearing on Monday. "Following the hearing, most, but not all, of the fraternity brothers and their families got together, laughed, patted each other on the back and hugged as if this was just another fraternity get-together," Piazza told NBC News in an email. 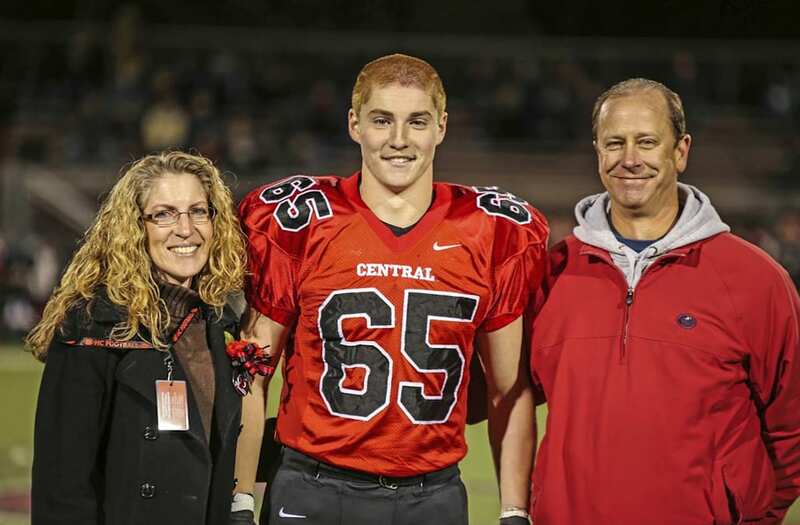 Timothy Piazza, 19, died after an alcohol-fueled fraternity pledge event at Penn State University in 2017. "We are highly offended by the insensitivity displayed given the severity of the crimes committed and ultimate outcome," he added. Timothy Piazza, 19, died in a hospital two days after a pledge event at the Beta Theta Pi frat house on Feb. 2. Authorities have said Piazza fell down a flight of basement steps after pledges were ordered to drink various types of alcohol at stations as part of a contest known as the "gauntlet." Various attendees of the event are accused of waiting 12 hours after Piazza's fall before anyone called 911. Now, 18 fraternity members face charges related to his death — ranging from involuntary manslaughter and felony aggravated assault to tampering with evidence. Sixteen of the accused were in court on Monday and two waived their right to the hearing. Prosecutors on Monday played hours of edited security video showing part of Piazza's final hours, which included him being carried around, plopped down on a couch, slapped and jumped on in a futile attempt to revive him. Penn State President Eric Barron said in a statement Tuesday the university was "sickened" by reports of what was shown on the Piazza video. "We are sickened by emerging reports describing video footage from today's arraignments," he said in the statement to NBC News. "Our hearts ache for the Piazza family." Jim Piazza on Tuesday also said a lawyer for one of the defendants, stood up during a break and allegedly said it was "cruel and unusual punishment" to make the attorneys be in court for roughly 10 hours. Other defense attorneys jumped in and joked about his comment, he said. "Of course this comes right after all of them watching video for five hours of what real cruel and inhumane punishment was when the fraternity brothers essentially murdered our son, tortured him, held him captive and left him for dead over a 12-hour period of time," Piazza said. Multiple requests for comment from the lawyer were not immediately returned. There were several tense moments during the hearing and District Attorney Stacy Parks Miller shouted down multiple attorneys as they tried to raise objections. Following the hearing, she said she thought the tone in the room was "unusual." "I'm going to be honest I've never seen such overt, crazy attacks, overt hostile attacks over nothing ... I'm not going to stand back and take that, but I thought it was fairly unprofessional," she said. Piazza's death resulted in Penn State shutting down the Beta chapter permanently after an investigation, and the Beta Theta Pi International Fraternity suspended the group. The university's board of trustees voted on a set of reforms, including taking more control of fraternity discipline, earlier this month.